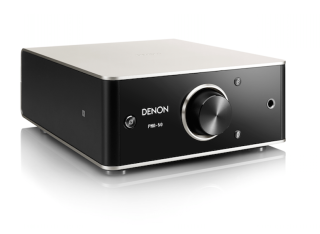 Denon unveils £399 PMA-50 compact stereo amplifier | What Hi-Fi? Denon has announced the introduction of the PMA-50 – part of what the manufacturer is calling a "new hi-fi series", with its latest product taking a full digital stereo amplifier and housing it inside a compact case. But don't let its small size fool you - the PMA-50 benefits from Denon's proprietary sound technologies, which include Advanced AL32 Processing and DAC Master Clock design. Denon says the PMA-50 delivers "superior audio fidelity" along with "high amplifier efficiency at 50W into 4 ohms". And for those wanting to pack in a bit of extra bass, there's a subwoofer pre-out provided too. Several digital inputs on offer from the PMA-50 include two optical and one coaxial, while you'll also find an analogue stereo input for legacy analogue sources. Elsewhere, a USB-B connection allows users to connect to a PC or Mac and play high-resolution PCM and DSD audio files; PCM up to 24-bit/192kHz and 2.8MHz and 5.6MHz DSD. Denon has included a dedicated noise isolation block, which can be found "prior to the digital amplifier" and is designed to help reduce unwanted digital noise from USB connections. For those who prefer to stream music wirelessly via Bluetooth, you're also in luck. The PMA-50 has an aptX Bluetooth receiver and NFC is supported for those with compatible devices. A dedicated headphone amplifier circuit with adjustable headphone impedance control is also built-in, offering settings for low-, medium- and high-impedance headphones. The Denon PMA-50 is available to purchase now either in black or silver finishes and comes with a price tag of £399.